News correspondent Thomas Hubert took the basic chainsaw course with FRS and shares his experience. 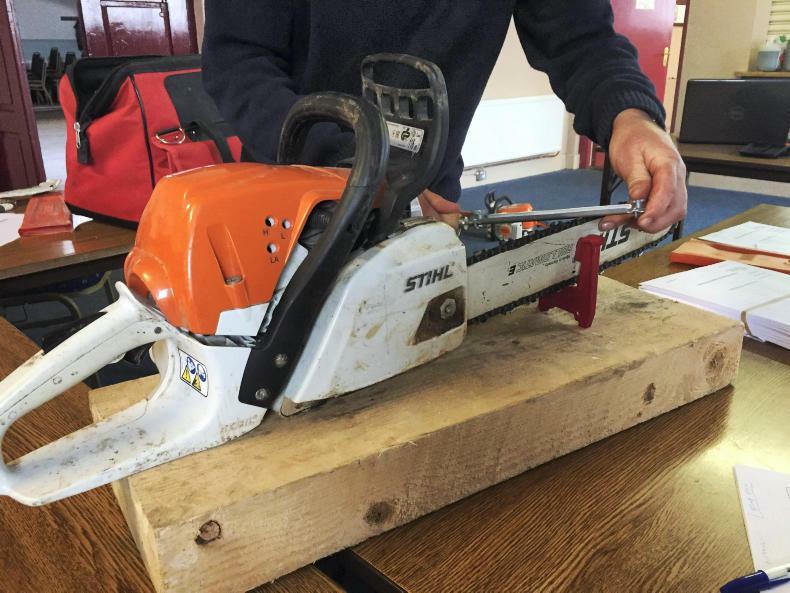 FRS Training offers a QQI Level 5 Chainsaw Maintenance and Operations course. It takes two days, usually one week apart, scheduled regularly at various locations around the country (see www.frstraining.com). The cost is €200. This course was delivered in Co Cavan by local trainer Kieran McGovern. Participants can bring their equipment, but chainsaws and personal protective equipment (PPE) are provided if you don’t have them. A simple written assessment is used to check that you remember key messages from the course. The first day of the course takes place indoors and begins with an exploration of the safety features on the chainsaw. You learn how to check that the brake, chain tension, kickback protection, chain catcher and other devices are in order. The course includes practical training on how to sharpen your chain, from choosing the correct file to the technique needed to maintain good cutting condition. “Always bring a file with you,” said Kieran. “If your chain goes blunt when you’re nearly finished, you’ll be tempted to keep going rather than go home and sharpen it,” increasing the risk of accident. Maintenance training also covers cleaning the machine, checking filters and the spark plug, fuel and oil quality and adjusting chain tension. A large portion of the course covers PPE. A helmet with mesh visor and ear protection is essential, as well as chainsaw safety trousers or chaps, gloves and boots incorporating a material that will catch in the chain and jam it upon contact. Jackets are available too. Noise levels are explained (see box). Kieran had detailed information on local or online safety gear suppliers and price ranges. “Boots, helmet, gloves and trousers are a must when you’re using a chainsaw,” he said. The second day takes place at the site of fallen trees outdoors. Storm Ali provided enough of this in Co Cavan. 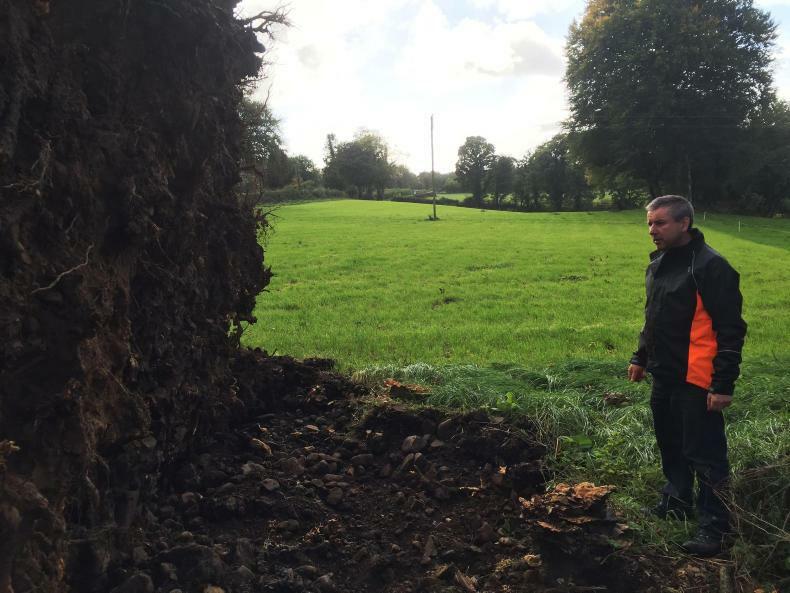 All pieces of timber bearing weight or threatening to become dislodged should be identified, and moved with a tractor or digger before cutting. Before starting, it’s also important to clear debris and trip hazards from the area where you’ll be standing. “Always have two people, or at least let someone know where you’re going,” Kieran said. A chainsaw should be flat on the ground and held in place with the operator’s heel on the handle before pulling the starter cord. Kieran said many farmers use the weight of the chainsaw by dropping it down while pulling the cord, but it can be difficult to control and there is a high risk of leg injury as it dangles around. As soon as the engine is running, test the brake to make sure it stops the chain. You should also run the chainsaw at full speed with the end of the chain close to a piece of timber to ensure that it is oiling properly: a spray of oil droplets will appear on the surface. Rule number one for Kieran is to always apply the brake before changing position. This will rule out injury from the spinning chain if you trip. The main cutting position should be standing firmly on your two legs with the chainsaw to the right of your lower body. Never use a chainsaw on a ladder. Holding the machine with firm outstretched arms reduces the risk of injury in case of kickback: your arms will form an arc and deflect the chainsaw from your body, whereas limp arms will fold against kickback towards you. The course also includes demonstrations of safe positions for branching and moving along a fallen tree, and how to deal with tension and compression caused by the timber’s weight. The safety decal on your chainsaw indicates its noise level – typically over 100dB. Yet under Irish law, 85dB is the maximum allowed for an eight-hour work day, and 80db the recommended value. Anything over that will cause ear damage. More dramatically, every 3dB over this divides the safe operating time by half, which means a 106dB chainsaw can be used safely for under four minutes only (see graph). Ear muffs come in different strengths with an attenuation value attached, depending on the thickness of the inside foam. By deducting the attenuation value from your chainsaw’s noise level, you can determine the safe operating time when wearing protection. A 106dB chainsaw would require at least 31dB ear muffs to be used for eight hours. David Wilson discusses personal protective equipment for chainsaw operation with Tim Thoma from Tree Care and Training. According to the Teagasc farm survey, approximately 7% of minor and major farm accidents are caused by a chainsaw. While training and competence is important, a lax approach to wearing the correct personal protective equipment (PPE) is a common factor contributing to such injuries. 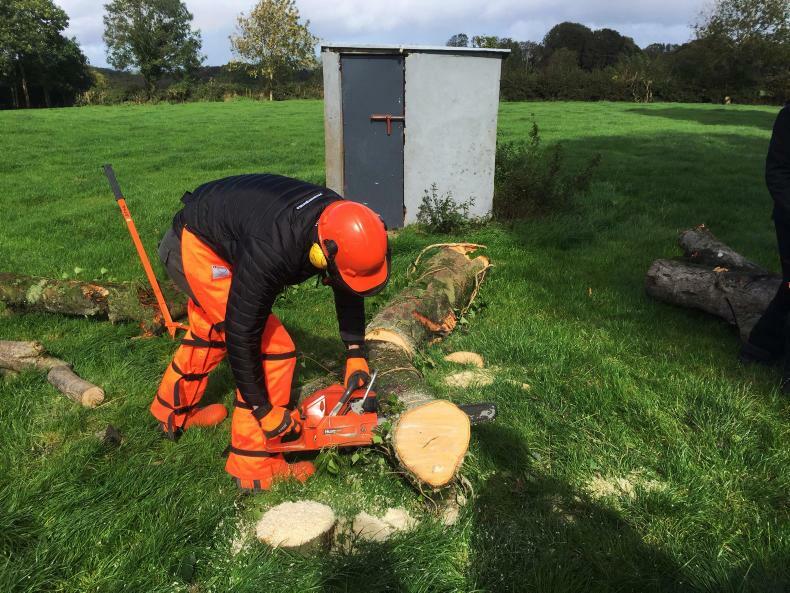 This week’ the Irish Farmers Journal talked with Tim Thoma from Tree Care and Training in Co Wicklow to see what essential PPE is needed when operating a chainsaw. Tim said the first point to note before purchasing PPE is to make sure they meet at least the minimum standards. Safety helmet (to conform to EN 397). Suitable eye protection (visor to EN 1731 or safety glasses to EN 166). Safety boots with steel toecaps and a good grip (EN 381/345). A safety helmet is a necessary piece of kit, offering protection from falling limbs and branches Tim said. “Loose branches cause a significant risk, with any forceful strike to the head likely to cause serious injury or even a fatality. It really offers some protection from the unknown,” he said. According to Tim, safety helmets must meet EU 397 regulations to ensure they have the proper specifications. “It is a good idea to get an all-in-one forestry or machinery-type helmet, which contains an eye-face protection and ear muffs as one,” he advised. Safety helmets usually cost from €30 to €50 to purchase. Tim says it can vary significantly from machine to machine, but noise levels of a chainsaw commonly measure around 110 decibels when in use. “With the safe noise level at 85 decibels, using a chainsaw for a significant amount of time poses a very real risk to your ears and over time will affect your hearing,” he warned. Tim said ear plugs are cheap and handy, and do help to muffle sound. However, he said while they will provide some ear protection, they are nowhere near as effective or as comfortable as ear muffs. “When purchasing ear muffs, it is important that they comply with EU 352 standards and have an attenuation rating of at least 25 dB (A),” Tim explained. A good set of earmuffs can cost from €15 to €30. 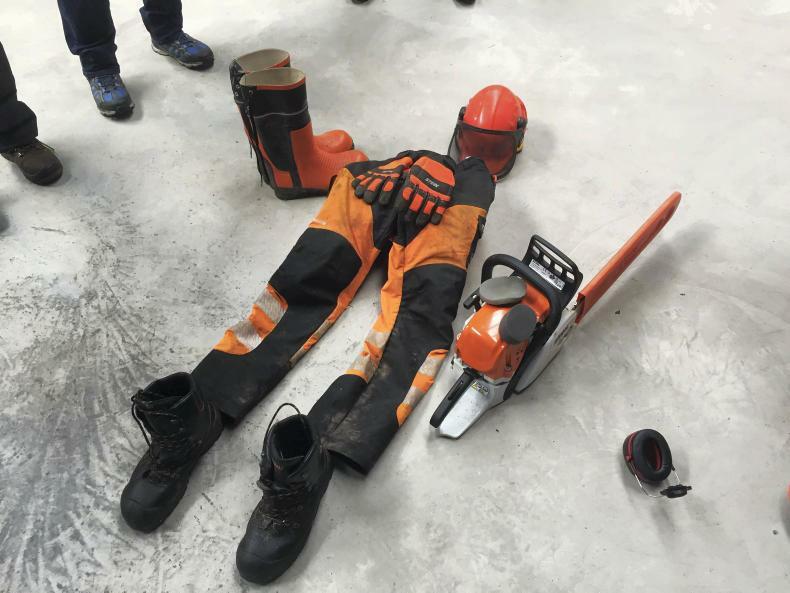 Correct protective trousers are an essential item of clothing for chainsaw users, Tim stressed. Like the other PPE gear, they must be worn to comply with the health and safety at work act. They provide protection from the chainsaw blade. If the chain comes in contact with the trouser material, special fibre lining entangles and brings the chain to a halt after contact is made. While these trousers are expensive, having a pair could save you from receiving a life-changing injury. “Anyone who works with chainsaws full time has usually received a few nicks in their trousers over time so they are very important. You should also follow the manufacturer’s washing guidelines to keep the protective material in good condition and upgrade them when required,” Tim said. Chainsaw trousers usually cost from €70 to €100. Correct footwear will provide you with a good grip and safety protection from the saw. “As part of regulations, chainsaw boots should be fitted with a protective toecaps, saw protection uppers and deep-treaded soles to provide a good stable grip. 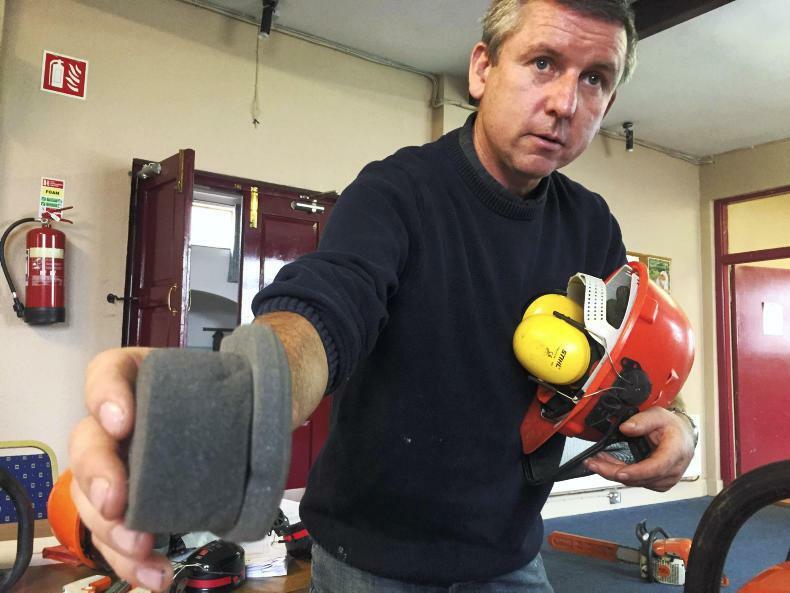 Chainsaw boots have three classes, with the minimum protection being found on class one and maximum on class three,” said Tim. As with any range of footwear, there is a huge variance in price across the market, with a good pair of chainsaw safety boots costing anything from €90 to €200. It must be noted, however, that good safety boots are long-lasting and are multipurpose according to Tim. Tim said gloves are important to wear too and should not be discredited. “Work gloves should always be worn when operating power tools. Gloves will protect you from cuts, scratches, splinters and engine oils. Saw protection similar to what’s in the chainsaw trousers is common,” he said. Gloves will also provide some comfort and ease from the high vibrations, which if left exposed for long periods can cause nerve and skin damage according to Tim. According to Tim there are many different types of padded jackets on the market which will provide some protection. “It is important that upper body clothing is tidy, close-fitting and comfortable. Materials worn should really be non-snag,” he explained. While not classed as PPE, a first aid kit may just save life or limb. “Found as standard on the harness used when climbing trees, it is a good idea for farmers to keep one close by, especially if working in an isolated area. It is important to have a large wound dressing available in the kit, to temporarily treat any wounds or gashes, which are the most common chainsaw injury,” Tim concluded. This week, James Taylor speaks to the final two of our four second-level national finalists in the ESB Networks National Safety Challenge. Alex Brady and Jack Brady from Coláiste Chraobh Abhann. Students: Alex Brady and Jack Brady. Alex and Jack Brady are TY students in Coláiste Chraobh Abhann, Kilcoole, Co Wicklow. 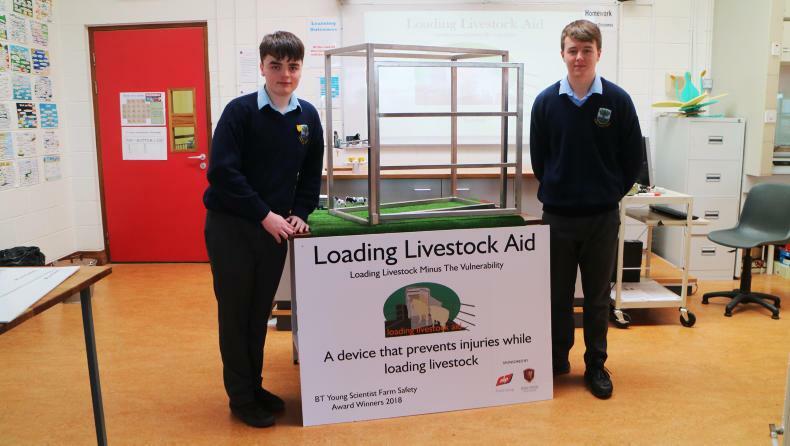 The Loading Livestock Aid has the aim to prevent injuries and deaths while farmers load their livestock. The device consists of a spring-loaded bar fitted to the gate post which they say can be activated by a lever on the trailer gate. “Once the bar is engaged, it moves through a set of ratchet teeth. If the livestock were to apply force, the bar will be locked in between these teeth, preventing the gate from swinging freely. The aim of our product is to stop the gate from flying back and possibly injuring the body of the farmer,” both students explained. “From conducting research and surveys, we believe that our product is original and there isn’t anything on the market that can be purchased and fitted to livestock trailers with the same aim as our device,” Jack and Alex said. Both students explained where the idea originated from and feel it could offer real benefits to farmers. “According to the Health and Safety Authority, 16% of deaths on our Irish farms were due to livestock-related accidents since 2009. We are young agricultural enthusiasts who feel that it is our duty to make sure farmers feel less vulnerable. We also believe that we are in a position to be able to reduce fatalities and injuries while farmers load their livestock. We must remember that not all injuries are recorded. Therefore, loading livestock could actually be more of a danger and pressing issue to farmers than we previously believed. Now, we are focusing on turning our device into a product and getting it out to market as soon as we can,” they stated. Both Jack and Alex have a passion for farm safety. “We had the desire and ambition to centre our project on the whole theme of loading livestock. We constantly felt anxious due to the hidden dangers that our parents face daily. “One of the main reasons that we began this journey was because a family friend was seriously injured when he was loading his livestock. Shock and a sense of panic hit us both as we couldn’t imagine an accident occurring to one of our parents. We have realised that cattle can become excited and, to a certain extent, quite aggressive while they are being transported,” they said. “In the small space in which loading livestock occurs, it is evident that the farmer wouldn’t be protected if a cow were to kick or push against the trailer gate during this procedure. Fortunately, nothing has happened to our parents, but you can understand how accidents may occur,” they added. Kayla McMahon and Fiona Kelly from Desmond College. Students: Kayla McMahon and Fiona Kelly. Idea: Eye in the Cab. 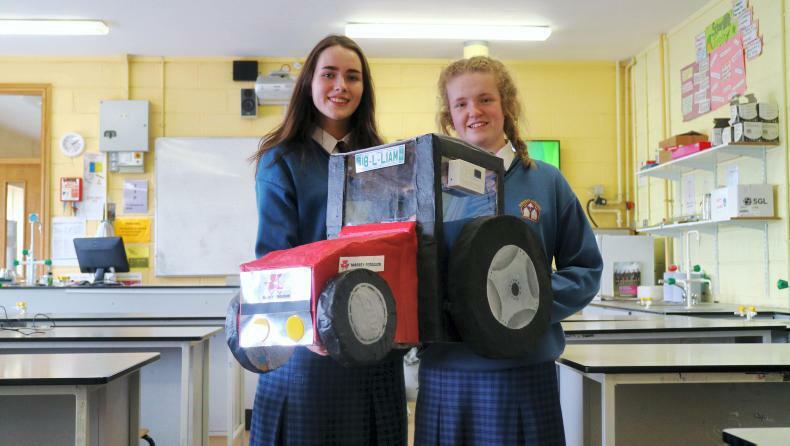 Kayla McMahon and Fiona Kelly from Desmond College, Newcastle West, Co Limerick, have developed Eye in the Cab, a device that you attach in the cab of a tractor. It detects the angle that the tractor is at and alerts the farmer if they are operating at a dangerous angle. The students made use of some sophisticated technology to put the plan together: “Using a gyro sensor, GPS modules and an auto dialler, we built a device that recognises the angle of the tractor. Gyro sensors, also known as angular rate sensors, are devices that sense angular velocity. “With the aid of an internal siren, it can alert the driver once a tractor has reached a 35° tilt and can alter the driver’s ICE contact via a STMicroelectronics SPBTLE-RF Bluetooth Chip 4.1 auto-dialler, once the vehicle has reached or exceeded 45° angle. The Eye in the Cab device can be fixed to the inside of the cab via magnets. It is also equipped with an emergency button on the front panel that the driver can press in an emergency. The two students said the main inspiration for the idea came from the fatality rates in agriculture. “Agriculture is a huge part of the lives of the people in Ireland. The fatality rate from workplace accidents in agriculture is far higher than any other economic sector. 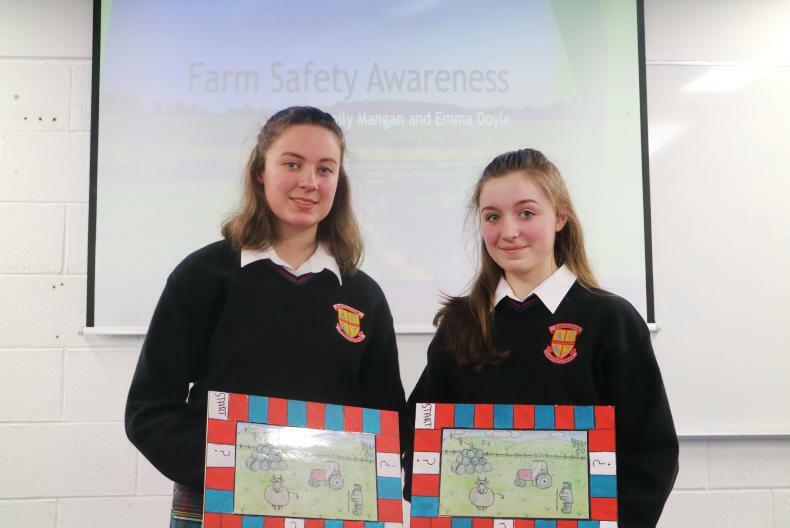 According to research carried out by the Health & Safety Authority (HSA), machinery-related accidents make up for 50% of farm fatalities,” Kayla and Fiona explained. “Factors that influence the probability of vehicles tipping over are the size, weight, angle of incline, terrain, front and back loaders as well as tyre size and pressure. The multiplicity of factors make it difficult for the driver to be completely safe. Our device will serve as an early mechanism and help reduce accidents. However, research informs us that when a tractor reaches an angle of 36.78°, it has a 75% chance of rolling over and at 45°, it has a 100% chance,” they outlined. 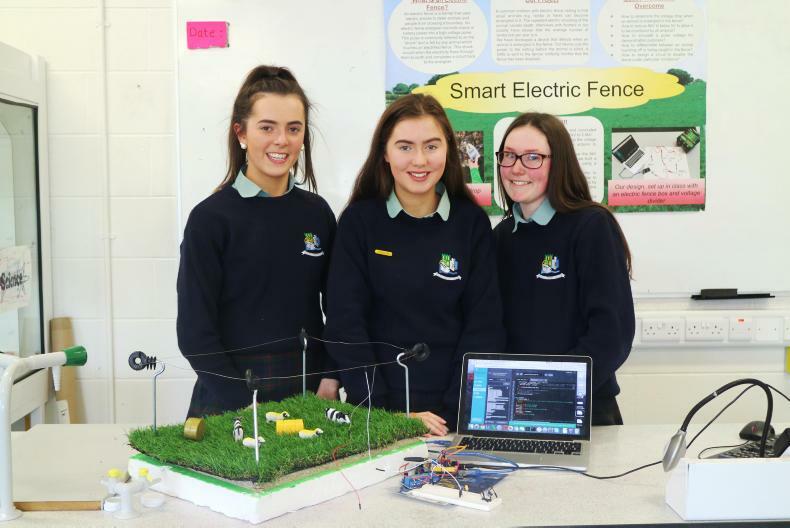 “It would mean a lot to us to win the ESB Networks National Safety Challenge and especially to know that even at our young age we could potentially save lives with an idea and project that we came up with ourselves. It would be a massive achievement for us and our school,” Kayla and Fiona concluded. DISCLAIMER: The products and designs listed were judged and awarded prizes for the purpose of the ESB Networks National Safety Challenge only. ESB Networks does not own or endorse these products or designs. Irene Finnerty, Aoibhe Lennon and Aoife O’Neill. Students: Irene Finnerty, Aoibhe Lennon and Aoife O’Neill. Irene Finnerty, Aoibhe Lennon, Aoife O’Neill are transition year students in Athlone Community College. They have designed “Smart Electric Fence”, a device that detects when an animal is trapped in the electric wire and cuts the electricity to the wire before it kills the animal. “Smart Electric Fence is a device that detects and disables an electric fence should an animal become entangled in it. Once the fence has been disabled, an SMS message is then sent to the farmer to notify them that their fence has been disabled,” they said. “We designed a voltage divider using resistors to drop the output voltage from 6,000 volts to 2.5 volts to allow it to be read by an Arduino (mini-computer). We then wrote the code for the Arduino to monitor the fence in normal operating mode and engage an electromagnet to cut the power to the fence if the voltage dropped by the predetermined amount, for more than 30 seconds. “The device then sends an SMS to the farmer notifying him/her that the fence has been disabled. “We coded our device so that it sends an SMS message to the farmer’s phone. We wired the product ourselves with the help of our teacher, Martina Roache,” the girls explained. “Safety is an important concern and all work has been reviewed by a qualified electrician to ensure it is safe,” they added. Irene comes from a farming background and has seen that animal entanglement involving electric fences is a serious problem for farmers. “I have seen first-hand that a lot of my Dad’s lambs have been killed in electric netting and many other farms in the locality suffer from this problem. Our project would be a great investment for farmers and could potentially save the farmer a lot financially,” she said. The device is not limited to farmers. It can be used by any electric fence user, such as a wildlife sanctuary, and will protect a wide variety of animals. It is not limited to lambs, according to Irene. “To win the ESB Networks National Safety Challenge would mean a huge amount to us. Our hope is that our project would improve animal welfare on farms all over the country and reduce farmer stress and financial loss. We hope that we can inspire other ladies to get involved in farming. We learned a huge amount as part of completing our project. It would be the icing on the cake to win. It would mean that all our hard work and dedication to the project would have paid off,” they said. Aoife, Irene and Aoibhe have big plans to take their project to the next level. “We hope to commercialise the product and add GPS technology to the device so that the farmer can locate where the fence has been disabled and where the animal has become entangled,” they said. Emily Mangan and Emma Doyle. Students: Emily Mangan and Emma Doyle. Emily Mangan and Emma Doyle are transition year students in Ashbourne Community School. They have designed a board game that is aimed at educating children about the dangers present on farms. “It’s a board game that kids can play and adults too, if they want to. There are general knowledge questions and safety questions and the objective is to get around the board as quickly as possible,” they said. “You roll the dice and whoever gets the highest rolls first. If you land on a blue square, you have to answer a general-knowledge question or on a red square you answer a safety question. If you get the answer correct, you stay in the new position. If you answer incorrectly, you have to move back to your original position before rolling the dice. “There are also squares with a question mark that have chance questions. If you happen to land on one of these squares, you will end up either moving forward two squares or have to go to hospital. If you end up in hospital you have to roll a three or five on the dice. Otherwise, you will remain there for two full turns,” the girls explained. “The person who moves around the board first wins, but you can go round a greater number of times to increase the difficulty,” they said. “We both felt that there weren’t many safety ideas out there for children to keep them safe on the farm so we decided to pursue our idea and do something for younger people. Children, by their very nature, are impressionable. We feel that if we can teach them about the dangers on farms from a young age, then it will stay with them into their adult years,” they explained. 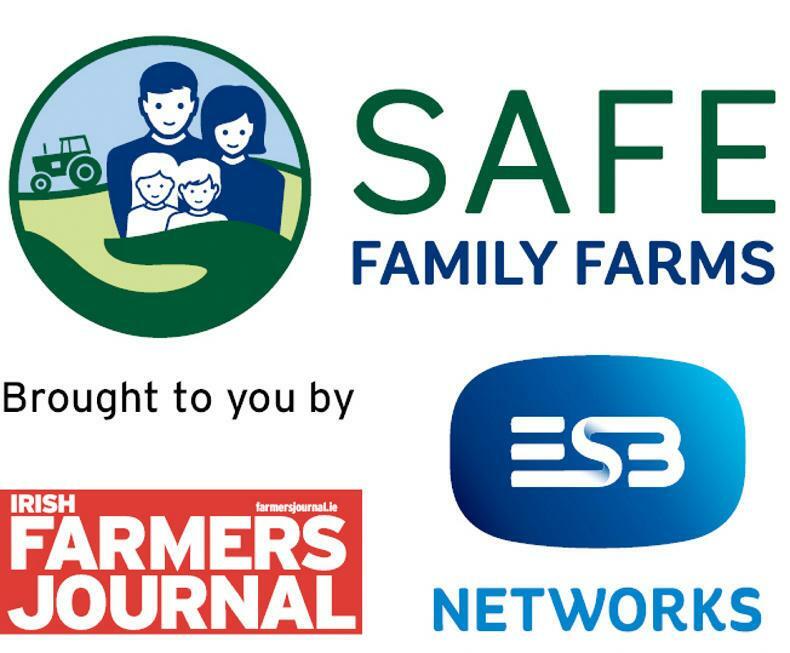 “We are both very passionate about farm safety as we have personal experiences of people being injured on the farm. We want to teach children to be safe on the farm,” they added.